I have recently found myself in a furniture makeover craze and have painted quite a few pieces in an effort to fabulize them, so when I saw that my friend Kendra of My Insanity was hosting an Extreme Makeover Party today, I decided I'd join the fun. This is my front room. I do not have a before picture of the mirror or frames so you will have to dig deep into your imaginations. Ready? The frames were black... easy. The mirror I got at Goodwill. The frame around the mirror is a resin-like material and had a hideous, dull bronzish finish. I removed the glass and the mirror, laid down plastic on the patio, grabbed my favorite spray paint ever...and set to work. The reason I chose this color is simply because it was on clearance and so I grabbed a few cans. 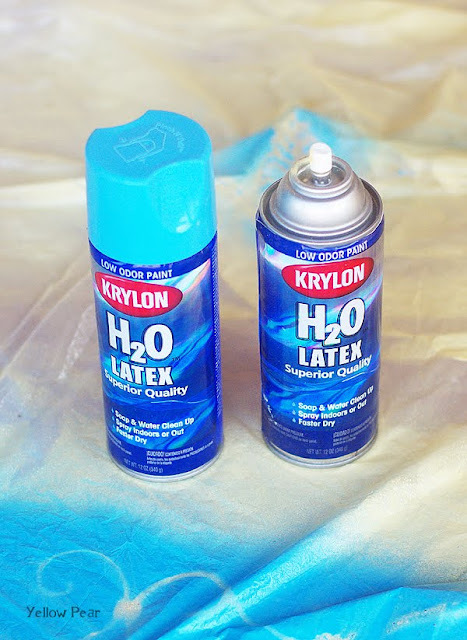 You never know when you'll need to spray paint something. But... I happened to love the color and have since decorated around it. Here is the scroll mid-spray. 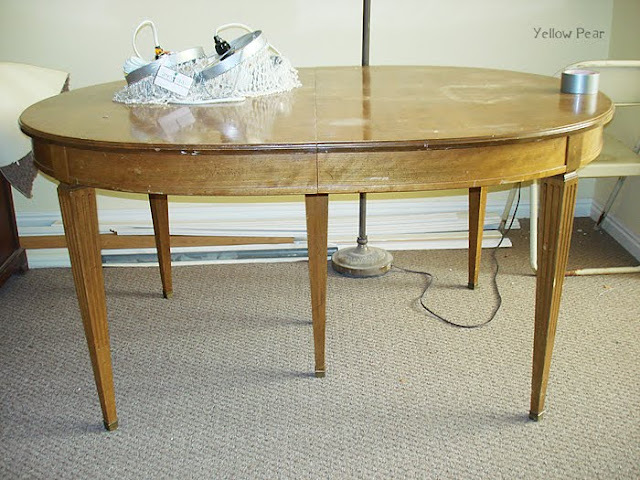 Next, I bought this table at a yard sale. Again, no before picture of the table but it was very beat up....wait... I had my dear sister email me a before snap that she had! Yay! 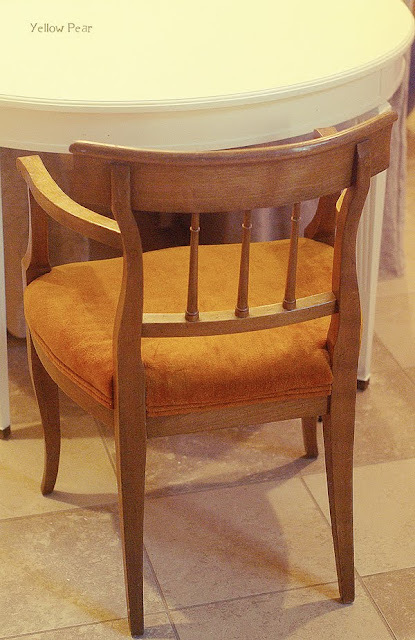 I really love the shape and detail and the fact that it has 3 leaves so it can be lengthened or shortened as desired, and had great visions for it and the six chairs. I ripped off one of the seat covers so I could set to work recovering, and realized that they were very old, very fancy seat cushions...complete with springs, rope, and a lot of other stuff. I changed my mind and bought chair covers... for now! 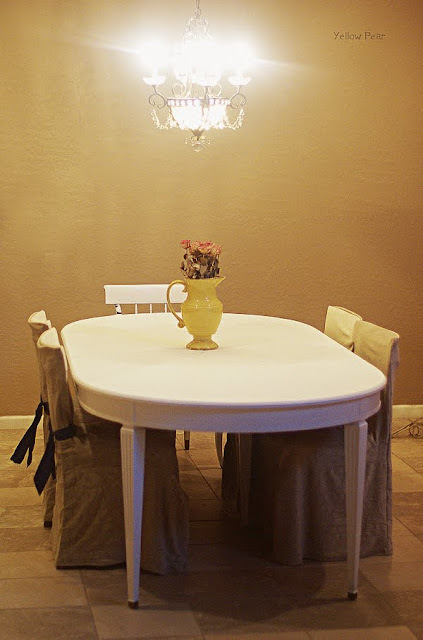 Here's the table painted a creamy white, the chair covers on (I am still fiddling with different ribbon ideas) and one of the end chairs nearly painted. I still need to paint the above chair and cover the two seats in a more overthetopstaplejob fashion. That will be soon. I will also cover the entire thing with polyurethane after a quick distress job. Also, these items were painted with a roller and a brush. I painted about 2-3 coats with good drying time in between. Spray paint doesn't work so well on large pieces like table tops because you usually end up with spray trails. Maybe others can spray paint better, but that's always what happens for me. 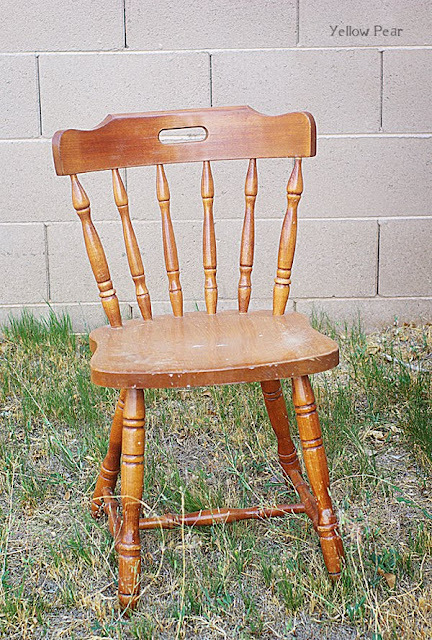 Then I inherited this chair and did not in the least bit like it. 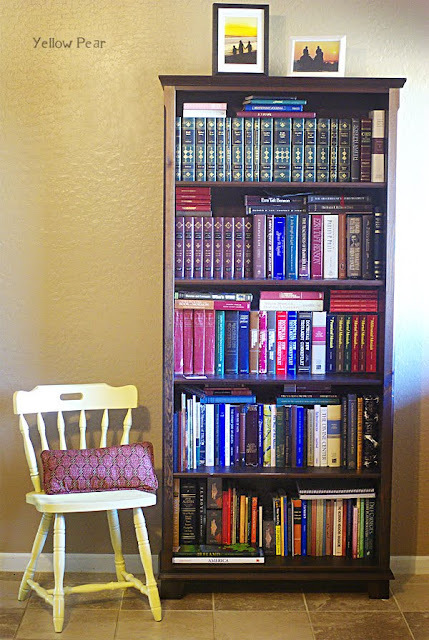 I had some of my favorite spray paint ever in a light antique yellow and so I transformed it and placed in next to a bookcase. And here are the beauties. This stuff is the best but I heard they are closing it out at Walmart!! I must find it somewhere else. It is a latex spray paint, has less fumes, it doesn't run as easily, it covers quicker and thicker and it's just plain lovely. 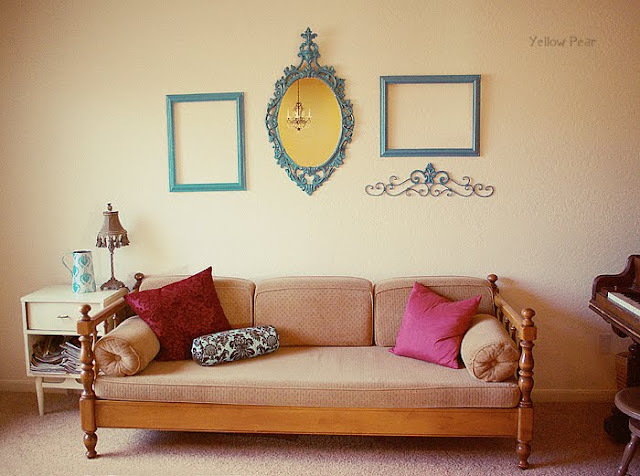 I have used it for my headboard, end tables, nightstands, a crib, many chairs and miscellaneous items. The only drawback is that your spraying finger goes numb after awhile and you have to try and spray with another finger or your non-prominent hand. But that's no big, really. For spray painting I usually try to be patient. The yellow chair took a couple of days because I'd spray a light coat on a few spindles and walk inside to finish up a chore...then back out for another spray...then inside....then I'd flip the chair over and do the legs...then back to laundry....and so on until it was beautiful. Many light coats is key. ETA: I lightly and I mean lightly sanded the table top. I did not sand anything else. I am always in a hurry to get a project done! The spray paint sticks extremely well to even slick pieces so I never worry about sanding when spray painting. I do a quick wipe down first though! 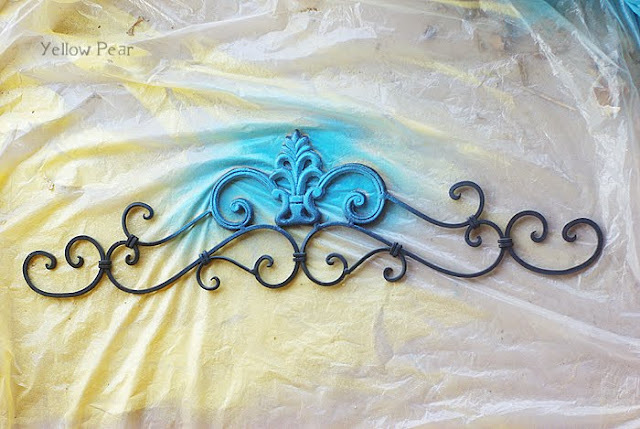 do you sand everything down before you spray or paint? I need to paint a huge table and 8 chairs and would give anything to not have to sand them first. They are really nice. The chairs have tons of little groves that are going to make them wretched to sand down. Good grief, Lou! You're putting us all to SHAME! What'll we we do?? You go, girl! You could have a second job on the show!!! Way to go, great transformations. Spray paint is my bff. Love it. What fun changes. I've been doing tons around here lately too. I'll have to post them. Seriously- your talent is rediculous!! Save some for the rest of us! J/K but really it is awsome and you really have an eye for stuff like that. I would never have been able to envision something like that. Looks great! So, I'm a really lousy party host (just getting around to commenting now)! But you are the queen of spray paint! And I am definitely showing your pics to my class tonight! Thanks for the tips about which brands you like. I'm sure I'll feature your projects on my blog in the next little bit, too. Great work!